Euphonix Inc. develops, manufactures and supports networked digital audio systems for music, film & TV post-production, broadcast, sound reinforcement and multimedia applications. Through innovative design, Euphonix products enable professional artists, producers, and engineers, to be more productive and creative than ever before. at Todd West Lantana post complex. Designed to handle a wide cross section of applications, System 5 is targeted towards post-production, music recording and on-air broadcast customers that require greater than 100 channel paths of full 24-bit digital signal processing at up to 96 kHz sampling rates. A total of 54 System 5 Digital Consoles - "The Three-in-One Solution" - have now been ordered. Liberty Livewire Corporation is the new name for the amalgam of international sound editorial and post-production facilities, including the former Todd-AO, Four Media, Soundelux, Pacific Ocean Post, Digital Sound & Picture, Sound One and related operations owned by the company. The various audio post-production and film re-recording stages were recently formed into Liberty Livewire Audio. "We looked at a number of all-digital designs," Bill Johnston offers, "and liked what the System 5 offers" in a powerful yet compact configuration. "For Lantana, we needed large-format solutions as well as a portable design that packs a lot of functionality into a small frame; the System 5 serves our purposes perfectly." Recently, the smaller System 5 was used on Lantana Stage #2 to provide additional sound-effect inputs for a companion analog console during pre-dubbing and remixing of director Billy Bob Thornton's new movie, All The Pretty Horses, starring Matt Damon, Ruben Blades and Sam Shepard. "Even though our Portable System 5 features only 24 on-surface faders," Johnston continues, "we can still access a large number of sources - which is exactly what we need from a Sidecar Sound-Effects Console. In addition to the two dubbing consoles, we needed the portable system so we can move it to other rooms at Lantana, Todd Hollywood, Todd Burbank or Todd Radford, should the need arise. In fact, when the first System 5 arrived in a number of boxes, it only took a few hours to assemble and be fully operational - older analog consoles, on the other hand, are large, cumbersome and difficult to move from stage to stage." In terms of the console's major advantages, Johnston cites several System 5 features that will make life easier on the dubbing stage. "The key is assignability - our operators like the System 5's 'soft' design and completely virtual user interface. Using the console's PatchNet [I/O Router], dubbing engineers can re-assign sources and stems to any fader on the console, and keep controls close to the central 'sweet' spot. We need that flexibility with multichannel surround-sound routing." And sonic quality is a major factor. "Today's productions - with maybe as many as 300 tracks being routed to final soundtrack busses - can generate a lot of additive noise," Johnston says, "simply because of the large number of sources and long signal paths through a conventional 18-foot analog console. But with an all-digital console like System 5, running 24-bit at a sampling rate of 48 kHz, we can minimize the amount to unwanted noise being generated from replay sources." Johnston also needs an enhanced degree of versatility. "System 5 is extremely flexible, because it handles not only film and video post, but also music recording and live broadcast. As these markets are heading in the same direction, we need to be able to accommodate a number of new-format sessions. For example, a growing number of engineers use stems as submixes, which can be recorded to separate tracks and merged within the console to provide a master surround-sound mix. We like what Euphonix has done with its Film Monitor Panel, which provides a very sensible layout for stem mixing." "All in all, the System 5 offers a lot of mixing power in a small package, and is easy to operate," Johnston summarizes. "We are evaluating System 5 to determine how it might match the requirements of our other post facilities." "We are honored that Liberty Livewire has selected a Euphonix System 5 for the Todd West Lantana facility, "offers company president, Piers Plaskitt. "Given the large number of facilities that the company operates around the world, we look forward to working with their staff to develop viable all-digital, network-capable solutions for video and film post production." Liberty Livewire Corporation (NASDAQ: LWIRA) provides a wide range of traditional audio and video post-production, transmission, library services, and audio/video distribution services via satellite and fiber to worldwide clients in the feature film, television and advertising industries. Also provides interactive television services under the brand name 'HyperTv with Livewire." Based in Silicon Valley California, Euphonix Inc. develops, manufactures and supports networked digital audio systems for music, film & TV post-production, broadcast, sound reinforcement and multimedia applications. Through innovative design, Euphonix products enable professional artists, producers, and engineers, to be more productive and creative than ever before. 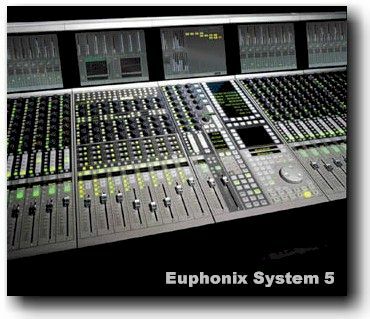 Founded in 1988, Euphonix has delivered more large format digital-control mixing consoles worldwide than any other manufacturer and is the first professional console manufacturer to deliver a 24bit 96kHz audio console and multitrack recorder to the industry.